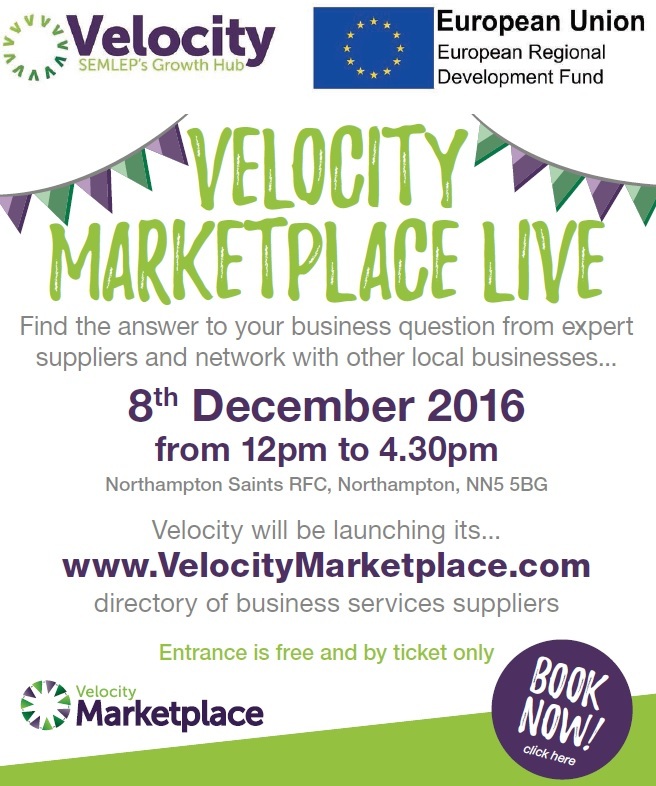 Last chance to book your place at our Marketplace Live event this Thursday, 8th December, at Franklins Gardens in Northampton. As the Velocity Growth Hub enters its third year of activity, we will be celebrating our success with previous and existing customers that received any type of business support from us. As part of the celebration we will be launching Velocity Marketplace a portal that will act as a corporate matchmaking tool designed to take the confusion out of business support and to make it more simple and easier for local companies to find and access the exact support that will help them grow, recruit and thrive. We have 30 exhibitors offering different types of support. There will be plenty of opportunities to network with the exhibitors and other delegates throughout the afternoon.At the event, you will have the opportunity to find out more about Velocity Marketplace and meet with a business adviser. The event will start at 12pm and run till 4.30pm. Below is a list of the organisations that will be at the event with their stands.